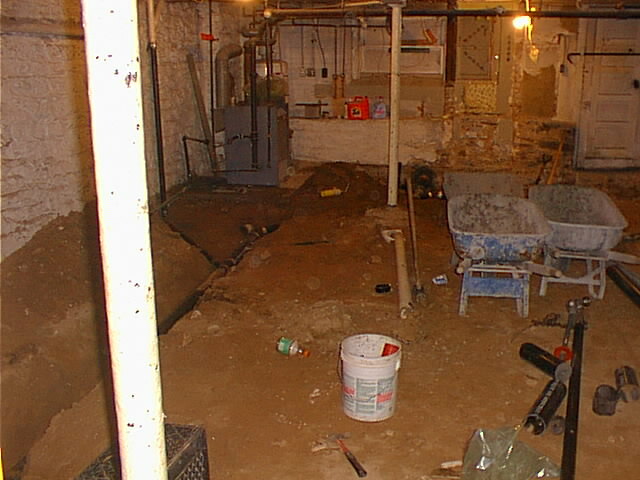 The basement was, well, a basement. Besides the obvious, the concrete floor had worn away to dirt in several places, there was evidence of severe termite infestation and the main beam had a serious looking crack. After adding a lally column for temporary support, the basement was so filled with obstructions that it would have been almost impossible to make it a functional living space (or in my case, a functional shop). 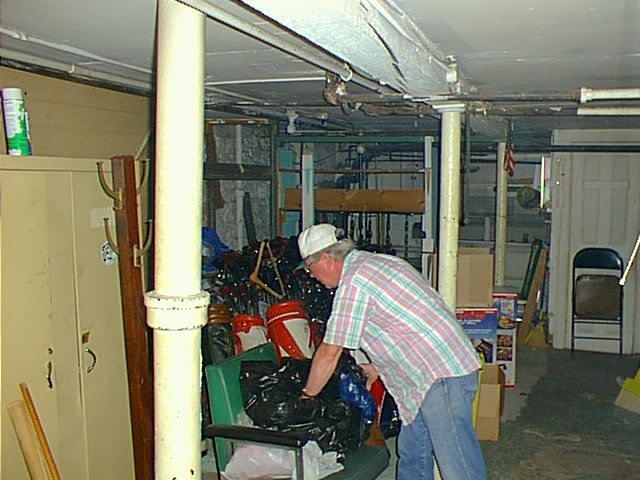 The seller’s cousin shows me around the basement storage room. Note the crack in the main beam over his head. Another less obvious problem, including one missed by two termite inspectors, was the colony feeding on the joists underneath that funky old drywall. The first order of business was three days of gutting. 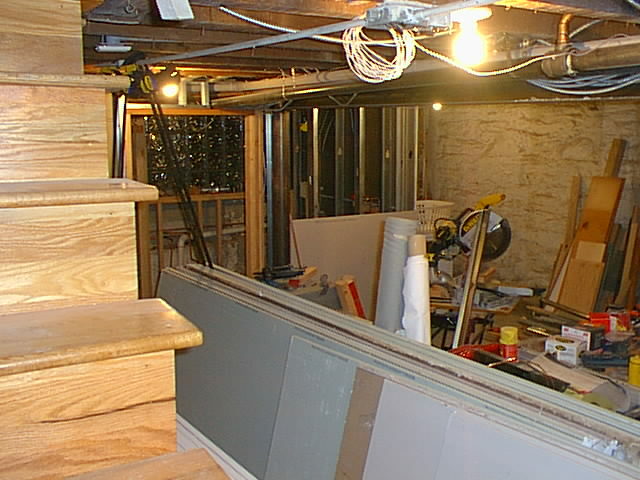 The basement was littered with partition walls built from odds and ends apparently found on garbage pickup day. 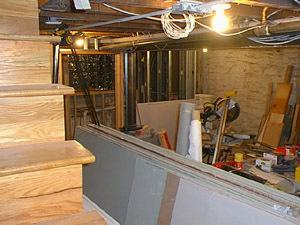 The stairway, or what was left of it by the termites, came down with a couple of well placed cuts of a Sawzall. Take a look at the angle on the john in the back. Guess where else those varmints hit. The next job was to rip up the concrete floor. As it was so thin and cracked, this was actually pretty easy. A sledge hammer, a crowbar and some strong backs were all that was needed. And a twenty cubic yard dumpster. 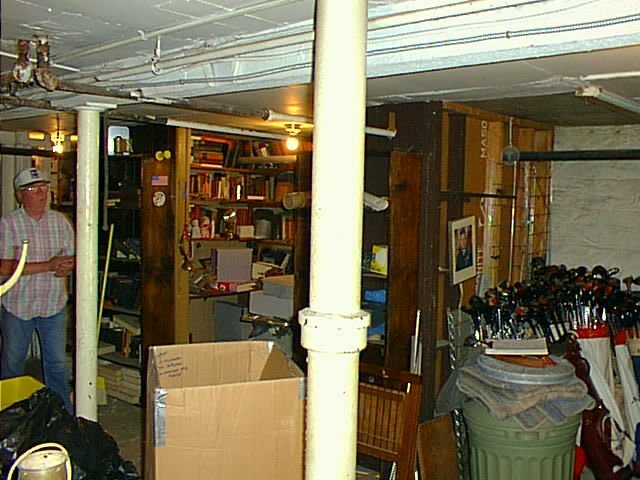 Since this was the perfect time to replace the hundred year-old plumbing, trenches were dug and new no-hub was run and plumbing roughed in for a downstairs bath. It was easy work for me because I left these two jobs to licensed contractors. Hey, I pick my battles. 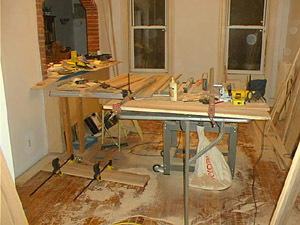 I originally wanted to drop the finished floor six inches but a laser level put that idea to rest. 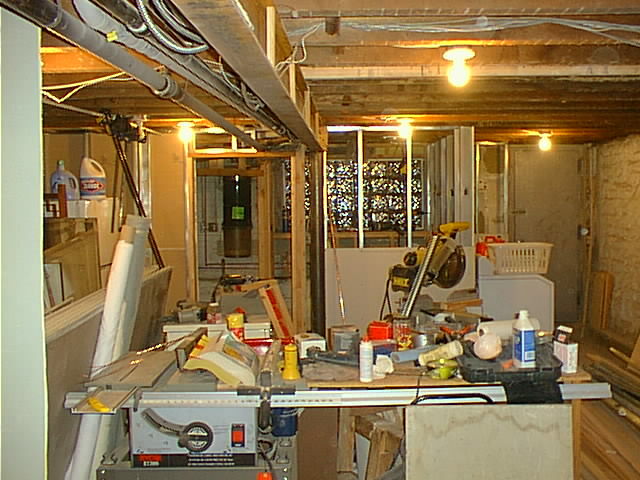 The existing floor was waaaay out of level. To do so would have meant having to re-pitch all the plumbing underneath. So I settled on removing eight inches of dirt at the back and two at the front. The upstairs waste pipe was also removed. It will be doglegged against the back wall at tie-in to remove yet another basement obstruction. 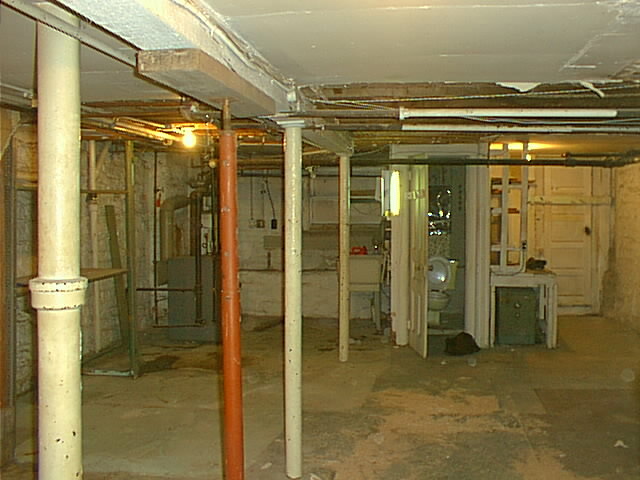 With a great deal of angst but the assurance of an engineer who said that it existed mainly to take the bounce out of the upstairs floors, the main beam and posts were carefully removed in order to get a clean 3500psi concrete pour. This really wasn’t the way to do it. While the house didn’t collapse, the upstairs plaster took a beating from it. It took a roll of mesh tape and three days of plastering to fix the hairline cracks. 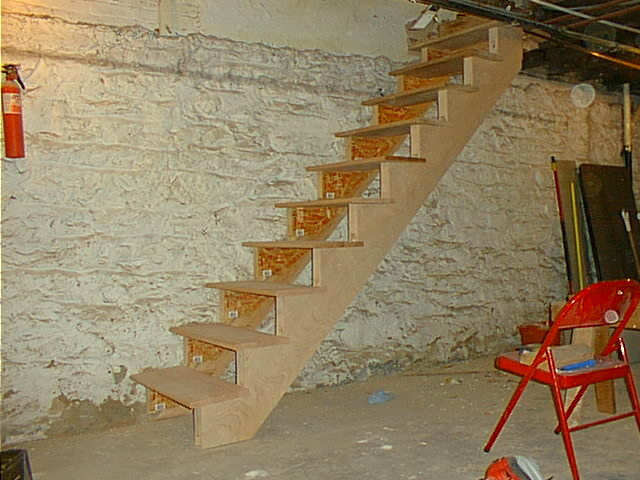 While the concrete cured, I went back to my dining room shop and began constructing treads and risers for the new basement stairs. A $1300 termite extermination gave me some assurance that this one wouldn’t suffer the same fate in the near future I got this much done in a day, thanks to a way cool stair tread system I saw on one of the home shows, Easy Riser. The hardest part was finding them. I eventually located a box in Indiana for $70. The treads were mounted temporarily while I finished the risers. A couple of scraps of 1/2" birch plywood served as a skirt board. The steam heat pipes, water, gas and most electrical have been relocated to the central soffet, next to the new steel I-beam. CAT-5 ethernet cable was pulled to a central punch block across the ceiling. 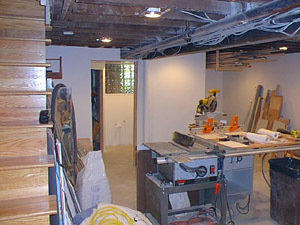 A central vacuum was installed (Vacuflo, visible on the back wall in the new utility room). Temporary lighting was installed. 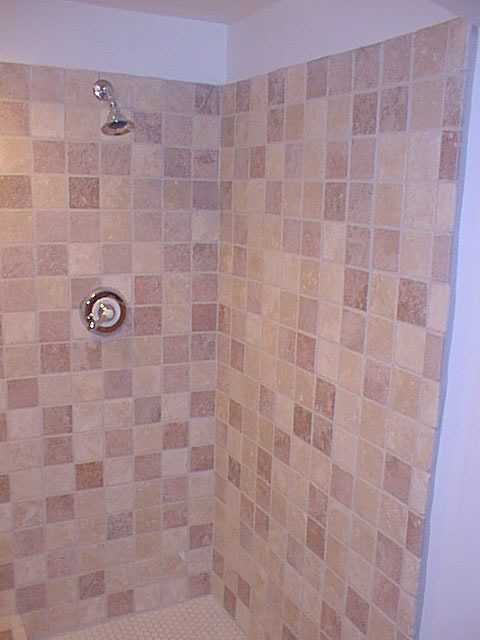 A full bath has been rough-plumbed, vented and wired, along with a laundry alcove. A glass block wall replaced the old termite-ridden double-hungs and a kalamein security door was installed. Another angle. I still have to frame the party wall. You can see the drywall I need for that. 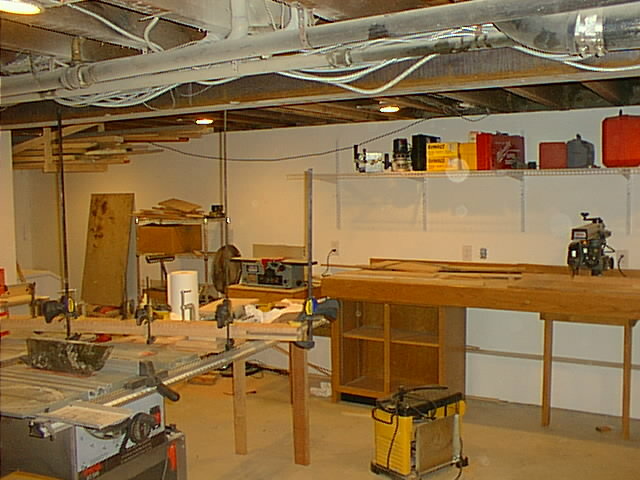 I just have to move that one last piece of conduit and the ceiling will be ready for can lights and sheetrock. One issue came up in the very cold weather lately: the fact that I don’t have any basement radiators. It’s comfortable now but once the utility room and that soffet are closed in, it could get a bit outdoorsy down here. I hit upon a novel solution: installing forced air vents along the soffet and a small squirrel cage fan to evacuate heat from that 2" steam pipe, possibly triggered by a thermocouple on the pipe. The basement may not be finished but the shop is functional. So I'm moving on to other projects in the living areas. Those clamps are securing one of the French doors I'm building for the living room rehab. 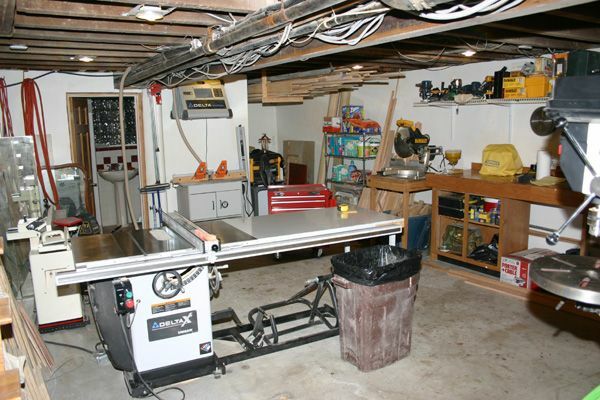 See all that dust on the pipes over the table saw? It's because of static electricity generated by the central vac pipe overhead. I get a lot of abuse for that red oak workbench I built. Three years later, with more tools. 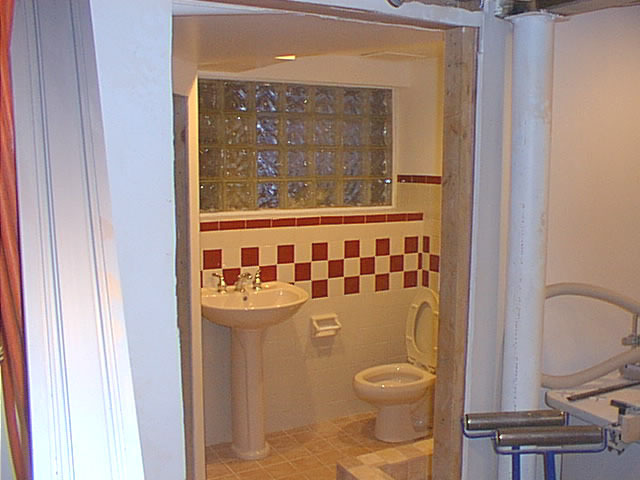 The basement bath is done, except for installing the doors. 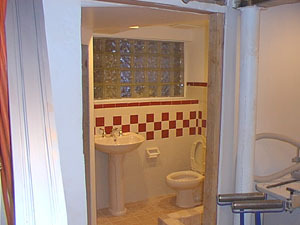 I'd like to say this was a painless job but just rerouting the plumbing to hide it under that pedestal lav, which I needed because of the restricted knee room for the john, took a weekend. The shower pan. This was a wonderboard, mud and liner job. 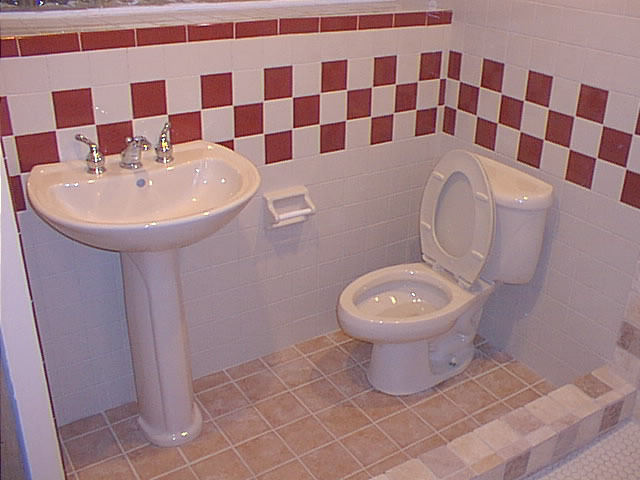 Yes, I know the tile match is dubious. 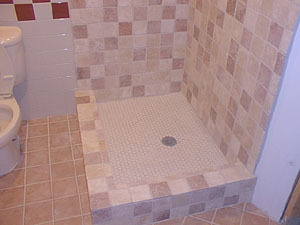 I started off building and tiling the shower and got a great deal on tumbled stone from a contractor overage. Unfortunately, I didn't have enough to do the entire bathroom and to buy this tile at retail would have blown the budget big time. That's my story and I'm sticking to it. view from the shop. I need to resize this shot, obviously. 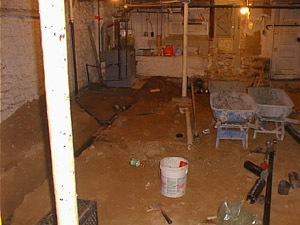 Does anyone know what's the going rate for finishing a basement per sqft? 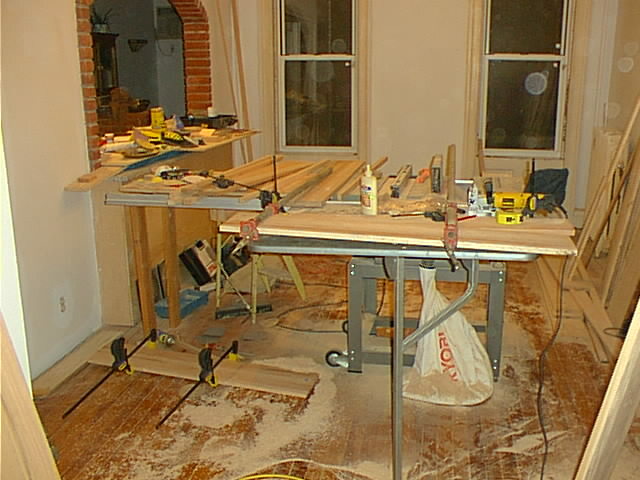 I thought about doing it myself as a DIY project, but lately I got busy at work and I am exploring options to hire experienced and licensed general contractors for the home project. It's kinda like asking how much it costs to build a house. It depends on what "finished" means, e.g. will it have a full bath? A half bath? Laundry room? Carpet or hardwood floors? 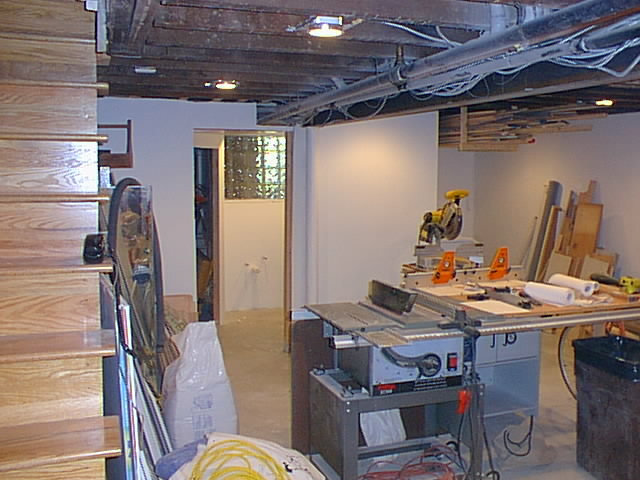 Drywall or dropped ceiling? Windows? Does it include new stairs? Is there a dampness problem to be corrected? New HVAC? 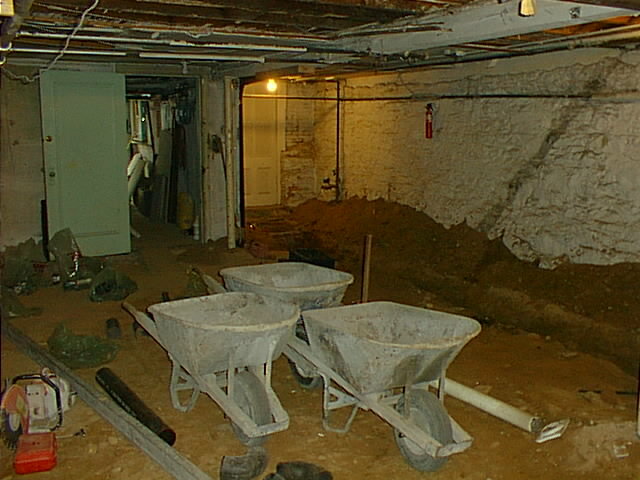 Generally speaking, most basements can be finished for between $15 and $40 a square foot, bearing in mind that smaller basements actually cost more per square foot than larger ones because there are certain fixed costs (like a bathroom). 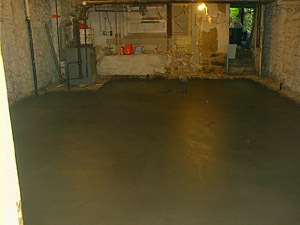 i) How did you finish the new concrete floor? ii) What kind of drainage system do you haveand/or recommend? iii) Do you have moisture problems? How big a gap did you leave btw the drywall and the stone walls? iv) I've seen cellars where the furnace and water heater have been walled off with cinderblock, presumably to reduce/contain fire risk. What do you think of that? 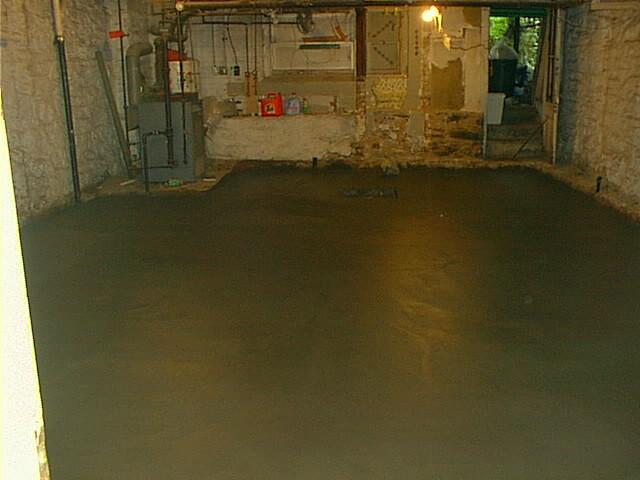 Since the basement was intended to be, and still is, my woodworking shop I just have the concrete slab that Frank O'Donnell poured. With all the stains, finishes and paints I work with in the shop it makes no sense to put down something nice. Drainage system: none. The cellar is street level at the front and only two feet below grade in back so it's not normally subject to flooding. However, there are storm drains in the garage and one just outside the rear entrance to catch water before it hits the basement. The drywall abuts dry party walls so I've had no problems there. 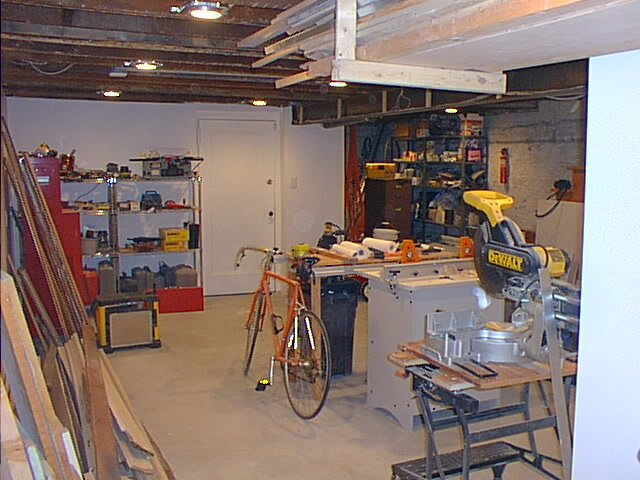 I think a masonry mechanicals room makes a lot of sense but you'll also want to protect the ceiling as well. Thanks for your reply. Even though I looked at the pics of the front of your house, I overlooked that yours is truly a basement not a cellar. Fortunately we don't currently have any major flooding/moisture problems but it's always a bit of a worry -- especially with the heavy rains we've been seeing in the past few years. We are planning to add two dry wells. Perhaps we should upgrade one of those to a sump pump for added protection. Great job with this. The transformation looks amazing and it has certainly provided ideas for the redesign of my house.